Lumbar degenerative disc disease is a universally experienced sign of spinal aging that is usually noticeable by the age of 30. Many people, including myself, were diagnosed with intervertebral disc degeneration far younger. I was 16 when the diagnosis was rendered to describe the structural changes in my lower spine. The effects of this diagnosis almost literally destroyed my life before it even had a real chance to begin. Degenerative disc disease is perhaps the single most misunderstood spinal condition in existence. Even the name of the condition is extremely controversial and involved in its negative influence on health. Among all the topics we cover on the various websites of The Cure Back Pain Network, degenerative disc disease in the lumbar spine remains the one that is always veiled in mythology, misnomer and propaganda. We have worked hard to counter these occurrences with the realities of the condition from a purely objective and scientific viewpoint. This essay will be no exception to that rule, but will go many steps further by providing our latest research findings on lumbar DDD. This absolutely crucial report will define and explain the truth of degenerative disc disease. We will separate verified fact from demonized fiction when it comes to what the condition entails, the symptoms it creates and the way it should be managed medically. If you are a person with degenerative disc disease (basically everyone over age 30, for sure), then this article can literally save your life. Do not skip a word! Degenerative disc disease describes the normal age and activity-related changes to the spinal intervertebral tissues in the backbone. The lumbar spinal discs are soft tissues that cushion each vertebral bone and help to absorb and distribute stresses in the spine. These tissues also elongate the spine and account for a significant portion of its overall length. Finally, the spinal discs are responsible for providing flexibility to the spine. Without them, the vertebral bones would all be fused together and would create a very different looking and functioning lifeform than modern human beings. DDD describes specific changes to the spinal discs, including a loss of height and general mass associated with drying out. It might also include changes to the outer disc wall, called the annulus fibrosus, including general deterioration and the development of cracks that might facilitate true annular tears. Lumbar degenerative disc disease is a leading contributor to lumbar herniated discs, but is also one of the factors that can reduce the severity of herniations, both clinically and symptomatically, since disc mass will be reduced compared to a herniated healthy and moisture-rich disc. Degenerative disc disease, as a diagnostic term poses a huge problem, as well as containing scientific inaccuracy. DDD is not a disease by any means. There is no process of contagion or pathology associated with disc degeneration. In fact, the process is completely normal, universally experienced to some degree and unavoidable in life. It is especially present in the lower lumbar levels of L4/L5 and L5/ S1. The name disease should not be applied here any more than in ludicrously cases of “gray hair disease”, “skin wrinkle disease” or any other normal age-related change to the anatomy. Degenerative is also a misnomer, since virtually all cases do progress for a time, but then stabilize, particularly once the disc is mostly dried out. The condition can not possibly progress beyond that, making degenerative an incorrect descriptive term. Proper diagnostic terminology for the condition begins with the most accurate: disc desiccation and includes alternate wordings such as disc degeneration, disc aging or degenerated disc. The word “disease” should never be utilized by diagnosticians due to the proven nocebo effect it creates and the subsequent negative consequences to overall health and wellness. Degenerative disc disease does not have to be caused by anything in particular. Injury and surgery can influence the progression of disc degeneration, but the process will exist in perfectly healthy spines, starting in the 3rd to 4th decade of life in most people. Degeneration of the spinal discs virtually never requires treatment, since it is rarely symptom-generating. However, DDD does help facilitate herniated discs and general spinal osteoarthritis, which can become problematic in rare instances. Similarly, DDD helps to contribute to foraminal narrowing, possibly inciting pinched nerves, as well as facet joint degeneration, potentially creating facet joint syndrome in the lumbar spine. Discs do not have internal nerve supply or blood supply. They do not feel any pain when they degenerate. Statistical fact overwhelmingly supports the truth that treatments specifically targeting disc degeneration, especially surgical approaches, generally fail miserably, since the condition is not often the source of incidental pain. Degenerative disc disease is a major player in the development and escalation of mindbody pain syndromes, since it is a frightening sounding diagnosis that seems to provide structural plausibility for naive patients who do not understand its universal and mostly innocuous nature. Therefore, DDD is one of the major sources of lower back pain not through any anatomical mechanism, but instead through purely mindbody interactions. 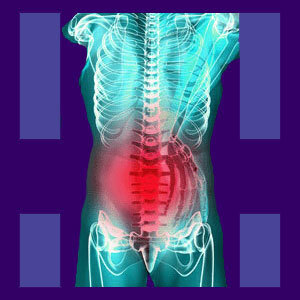 The best coverage of degenerative disc disease is surely on Herniated-Disc-Pain.Org. This website has been explaining and treating spinal disc problems for many, many years.